We designed the JL Sequel Splash Jacket to keep out the damp and chill in the boat -- to be worn even after you warm up and begin to sweat. It differs from the Purist jacket with a high neck and a slightly lower front. The Sequel is windproof and waterproof, with a four-way stretch and a vented back panel for comfort. 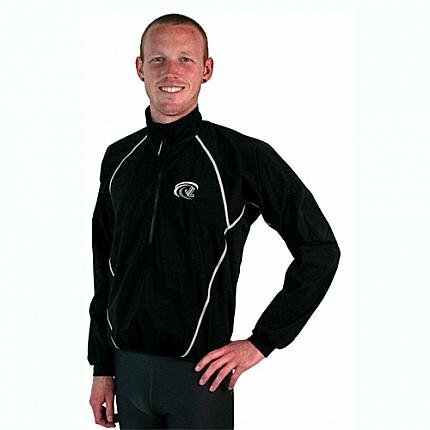 With side panels made of Drywick, the inside lined with light wicking mesh, and a quarter zip that won’t interfere with your stroke, this jacket is the ultimate in breathability and movability. This jacket is UNISEX; great for men and women! The JL Sequel is a superb rowing jacket, one that performs on and off the water. Versatility is this jacket's middle name (if jackets had middle names...). It comes standard with: - High Collar--Lined in Drywick to keep your neck warm. - Snug Front--Nothing curling over or getting stuck at the release. Nothing loose across the body to flap in the wind. - Long Tail--lays flat against the lower back, keeping the lumbar region warm and dry. The tail will not catch in the tracks, as it is designed to float above. - Long Arms--Arms are cut very long to prevent bunching up at the forearms when at full reach. P.S. Bet you didn’t even notice the secret key/credit card pocket standard on our Sequel jackets! Give you a big hint... It’s right inside the zipper.